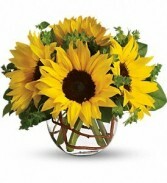 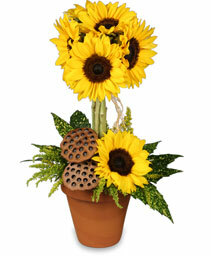 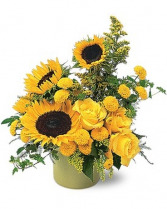 With bright yellow sunflowers and roses, it''s like bringing a little bit of the outdoors in. Sunflowers, chrysanthemums and roses arrive in a matching cachepot. 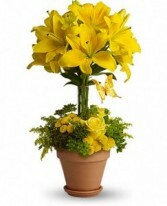 Like freshly squeezed lemonade on a hot sunny day or any day. 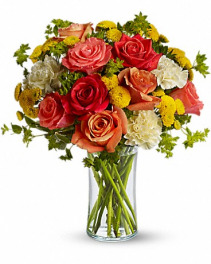 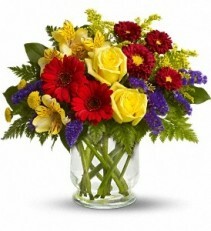 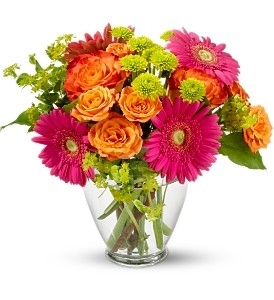 This bright and cheerful bouquet sure to make someone smile. Dark orange, coral and orange roses, light yellow carnations, yellow button spray chrysanthemums and greens fill a slender gathering vase. It's a kiss of summer! 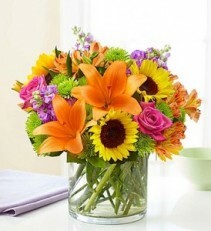 Glow for it! Capture the magic of a tropical sunset with this gorgeously glowing bouquet. 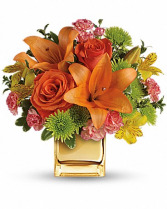 Lush lilies and roses in radiant shades of orange and yellow are presented in a frosted orange Cube for a touch of instant glam. 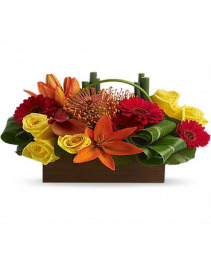 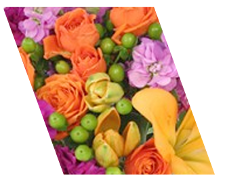 Soft orange roses, asiatic lilies and miniature carnations are arranged with yellow alstroemeria and green button spray chrysanthemums. 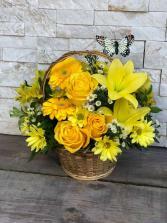 Delicate oregonia and pittosporum add contrast. 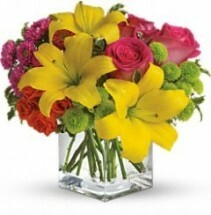 Delivered in a Mirrored Cube. This arrangement is full of the freshest roses, lilies, stock, sunflowers and alstroemeria in a classic cylinder vase, its compact beauty is perfect for impressing friends and family or for simply dressing up any room in the home. 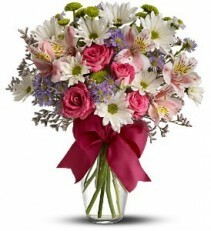 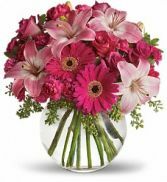 A cheerful arrangement made with yellow lilies, pink roses, green buttons, and hot pink asters. Bright yellow lilies are uniquely arranged into a topiary and grounded in a warm terra- cotta pot overflowing with fresh greens. Sure to brighten their day, this vivacious bouquet packs a punch with its vivid mix of hot pink, yellow, orange and purple blooms. 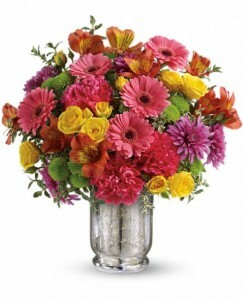 It's delivered in our sparkling Mercury Glass hurricane - an elegant keepsake to be enjoyed for years to come.